Zephyr Dynamics, the clever folks who brought you Pod Paws for bipods, have crafted an impressive new automated annealing machine. 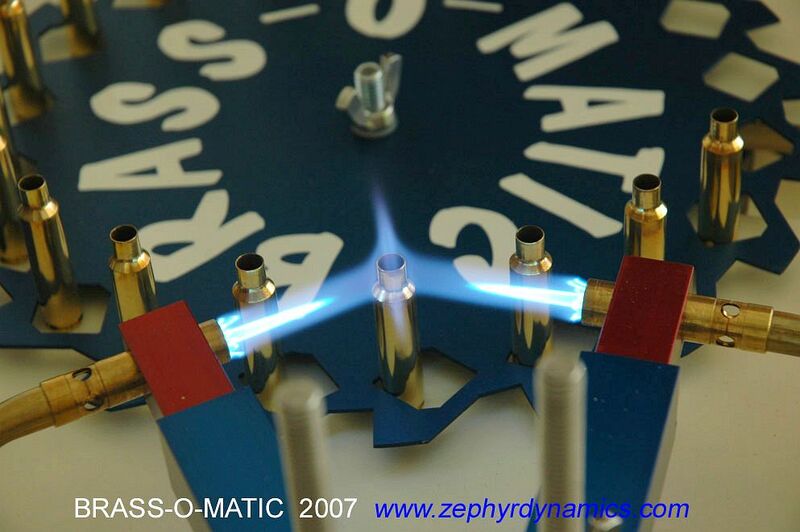 Unlike other mechanical annealers on the market, Zephyr’s $399.00 “Brass-O-Matic” is designed to anneal ALL sizes of rifle brass–from .223 Rem all the way up to 50 BMG. Two arms hold high-output torches (bottles and tips not included in price). You can adjust the height of the jets to place the flames right at the “sweet spot” of any length case. With two burners fixed nearly opposite one another (see photo), the case neck and shoulder are completely enveloped by flame for uniform annealing. The rotational motor has a speed control so you can adjust the dwell time for your particular brass. How well does it work? To be honest, we can’t say because we haven’t got our hands on a production version yet. Palma and F-Class ace Jerry Tierney has purchased one of the first run and he’s promised a full report as soon as UPS delivers his Brass-O-Matic. To see the machine in action, check out the video below. 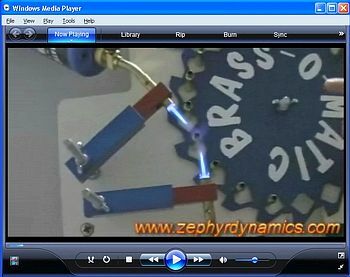 You’ll find another video, and more information, on the Zephyr Dynamics website. Share the post "New, Versatile Brass-O-Matic Annealing Machine"
This is an ideal unit if you load at the bench. It’s also great for a handgunner or Highpower shooter who needs to haul a lot of gear. 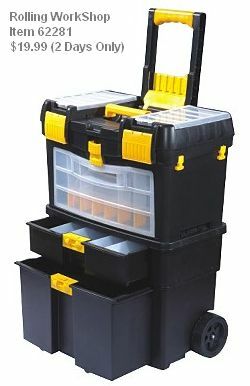 Multiple plastic bins will hold reloading tools, bullets, bushings, and dies. The large compartment at the bottom can comfortably hold a Shooting Chrony or a compact Spotting Scope plus muffs, targets, and other range gear. And when you’re not hauling gun gear around, this unit can be used to store and transport your general household or workshop tools. This versatile unit has a fold-down carry handle and the top section can be separated from the bottom. The lower section has two pull-out drawers — one with removeable dividers. Sound good? Well, for the next two days, you can grab one for just $19.99. (Regular price was $39.99). Sure as shootin’ every home workshop can use one of these magnetized stainless steel parts trays. Two large, rubber-covered permanent magnets on the base hold the tray to metal surfaces. But more importantly, the whole tray is slightly magnetized, so small metal parts, fittings and tools stay put. Fantastic. No more lost Wilson bushings, or tiny scope mounting screws rolling off the bench into oblivion. You can also use this to hold decapping pins, small allen wrenches, firing pin springs, drill bits–anything that can be magnetically attracted will stay in the tray. 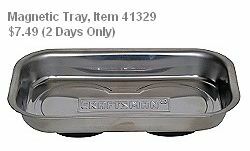 For the next two days, this handy tray is just $7.49 (Regularly $14.99). Note: Most user reviews are very positive, but there have been some complaints about short battery life (same as with rechargeable screwdrivers). If you have a problem, you can have the battery dates checked, and Sears will replace defective batteries. Share the post "Get Thee to Sears Today or Tomorrow…"
There was much interest in the solid bullets featured here yesterday. In particular, many readers were interested in the drive band design shown on the LM-105 bullet. GS Custom has been making bullets since 1983. It currently has a range of 226 different bullets for tactical, hunting and sport shooting, of which 172 are drive-band bullets. 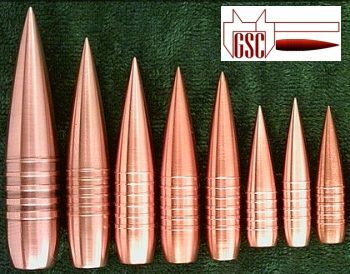 GSC SP Bullets, such as the orginal LM-105 design, are turned monometallic copper bullets. They are Long Range VLD Match Bullets of advanced design to minimize barrel wear and maximize speeds. Ordinary (non-drive-band) solid, lathe-turned bullets look beautiful, but in the larger sizes there are some problems associated with solids. Gas sealing can be worse than jacketed bullets, and solids have been known to copper foul barrels more quickly than conventional bullets. The hardness of the bullets is tough on throats as well. Schultz believes that drive band technology allows increased speeds over conventional bullets of comparable weight. The added speed means wind drift is reduced, trajectories are flatter, and time of flight is reduced. The lathe-turning production process also allows the bullet to be optimally pointed for the highest possible BC for a given bullet weight and length. GS Custom sells its bullets through an international dealer network, including Custom Brass & Bullets in the USA. Share the post "Drive Band Bullets From GS Custom In South Africa"